When the 83,139th and last Standard Eight rolled off the production line at Canley on Friday 9th July 1948, it wasn’t sold or given to a museum. 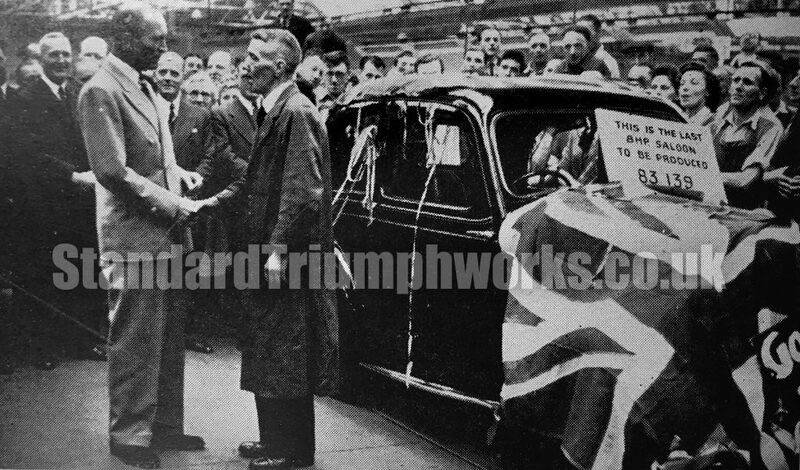 Managing Director Sir John Black presented the car to the company’s oldest employee, fitter Albert Edward Smith, as reward for his 43 years’ service. Mr Smith was pleased as punch with the gift, having worked on the very car he received. But because he didn’t drive, he entrusted the car to a fellow Standard employee – his son, also called Albert but better known by his middle name Eric. Eric’s widow Lillian Smith, now aged 85, said: “My father-in-law was really excited. It was such an event. You never heard of people having a car given to them at work. “When my husband came home and told me, it cheered us up. We sold our car and got a garage built at the back for the new one. It was estimated that the company wage bill when Mr Smith joined in 1905 was £3,000, compared with £5million in 1948. Mrs Smith, a former part-time typist at the Coventry Eagle cycle company in Tile Hill, still treasures the newspaper cuttings of the event, along with a telegram her father-in-law received from Sir John Black when he retired in 1951. The family’s connections with Standard-Triumph continued, with Eric working as a tester and fitter, and a member of the works fire brigade, until he retired in about 1980. Pipe band sent sports cars on their way.